A Pessimist Is Never Disappointed: R.I.P. Forrie! I'm not going to elaborate on his life story, or why he's important to so many, but I will reference my meeting with him, briefly touched upon in this recent post. That convention in 1997 was probably the first sci-fi or film convention I had attended since a shabby one in Biloxi, Mississippi in 1978 that I begged my parents to take me to. And I really didn't expect to see Forrie at the convention; my friend and I were attending for Caroline Munro and the other Hammer luminaries in attendance. So it was a totally unexpected sight to round the corner and suddenly see Forrest J. Ackerman manning his own booth that cloudy Sunday, eating a Pizza Hut Personal Pan Pizza. In fact, it took me a second to process the fact and I was probably a bit awestruck much like when I met Ackerman friend Ray Harryhausen at another convention a few years later. I mumbled my thanks and got an autograph -- Forrie even had cool postcards of himself ready to hand out. And when thinking back to the first 10 years of my life before the arrival of Star Wars, I can't think of many people in film who influenced me as much as Harryhausen. And I knew of him because of Ackerman's magazine, Famous Monsters of Filmland. I got my first issues, when I was probably about 7, at this old drug store whose name escapes me in District Heights, Maryland while my grandparents babysat me before my mom picked me up after work. That would give me a few hours to enjoy the mag before my mom would cut out the scary pictures; I can still recall pleading me with mom, "That picture doesn't scare me!" Or: "But the picture on the other side of that page is of King Kong!" 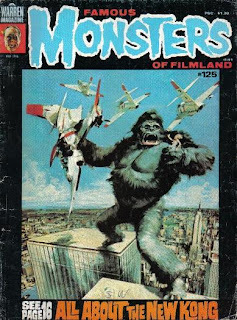 And that may sound silly but, in that era, Famous Monsters was the only magazine I can recall that actually covered the making of monster films, specifically classic ones. I learned about Jack Pierce, for instance, from that magazine. That magazine, my grandfather's stories of working in a movie theater in the 1920's and 1930's, and a few books from the library were the foundations of my education -- what made me a movie fan. 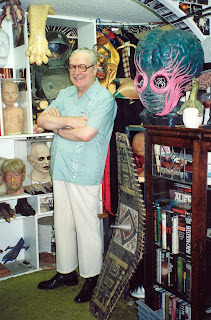 And I will be indebted forever to Forrest Ackerman's work.